Der Artikel Giacomo Meyerbeer (1791-1864): Dinorah wurde in den Warenkorb gelegt. Nach unserer erfolgreichen, mit dem Echopreis 2015 ausgezeichneten Oper »Vasco da Gama« (Beste Editorische Leistung des Jahres 2015!) möchten wir Ihnen auch eine weitere Meyerbeer Oper nicht vorenthalten. Den meisten Opernfreunden ist Giacomo Meyerbeers DINORAH nur von einer einzigen Aufnahme her bekannt. Es war die Interpretation der Wahnsinnsarie »Ombre legère« durch Maria Callas, die lange dafür einstand, dass die Titelheldin dieses Werks eine Schwester jener anderen großen Opernfrauen wie Donizettis Lucia, der Amina aus Bellinis NACHTWANDLERIN oder der Ophelia aus Ambroise Thomas' HAMLET ist, die sich vor einer Welt, die sie nicht mehr begreifen, in die Umnachtung flüchten. Als Ganzes ist die 1859 uraufgeführte Opéra comique DINORAH oder LE PARDON DE PLOERMEL jedoch noch immer zu entdecken: Meyerbeer gelingt hier eine späte spielerisch-poetische und zugleich humoristisch gebrochene Beschwörung der Welt der romantischen Geister- und Feenwelt. In seiner Mischung aus lyrischen, folkloristischen und komischen Elementen entwickelt Meyerbeers Vertonung der Geschichte um das auf seiner Wallfahrt durch mysteriöse Umstände getrennte und dann wieder glückliche vereinte Brautpaar Dinorah und Hoël eine ganz eigene, subtile Farbpalette. Following our successful release of Giacomo Meyerbeer's opera Vasco da Gama, a production awarded the Echo Prize for the Best Editorial Achievement of 2015, we are now also eager to present to you another opera by the same composer. Most opera fans know Meyerbeer's Dinorah only from a single recording. For a long time it was the interpretation of the madness aria »Ombre legère« by Maria Callas that earned its title figure mention as the sister of other great opera heroines like Donizetti's Lucia, Amina from Bellini's Sonnambula, and Ophelia from the Hamlet of Ambroise Thomas: she too flees from a world that no longer understands her and seeks refuge in madness. In its complete form, however, the opéra comique Dinorah ou Le Pardon de Ploërmel continues to await discovery. Here Meyerbeer, late in his life, succeeds in producing playful, poetic, and humorously ironic evocations of the world of romantic spirits and fairies. Meyerbeer's setting of the story focusing on the lovers Dinorah and Hoël, separated under mysterious circumstances during a pilgrimage and then happily reunited, mixes lyrical, folkloric, and comical elements lending the music a subtle color palette all of its own. cpo's preisgekrönter Meyerbeer ("Vasco da Gama") ist noch in bester Erinnerung, da überrascht das Label erneut mit einer bei cpo schon bestens bewährten Aufnahme der Deutschen Oper Berlin: Meyerbeers fast vergessene Oper "Dinorah", jene Handlung über Trennung, Liebe, Schmerz und Vereinigung eines Paares, die eigentlich zu Herzen gehen müsste. Gehalten hatte sich aber nur die Wahnsinns-Arie und das auch nur wegen der Callas. Dabei entfacht schon die Ouvertüre einen ganz eigenen klanglichen Reiz. Im Folgenden agieren die Solisten fabelhaft, der Chor ist agil und schlagkräftig und die Aufnahme aus der Philharmonie live bestens aufgezeichnet. Woran liegt also das Vergessen? Bei manchen Werken der Musikgeschichte sucht man vergeblich nach einleuchtenden Gründen. Bei dieser Oper mag es vielleicht der Mangel an eingängigen Melodien sein. Vielleicht sind es auch die (später) veralteten Melodramen mit Sprechpartien, die den musikalischen Fluss immer wieder unterbrechen, vielleicht auch die für Opern immer noch ungewohnte französische Sprache. Wie dem auch sei - der üppig ausgestattete cpo-Produktion mit dem über 150-seitigen, dreisprachigen Booklet und dem komfortablen Case im Schuber sei ein großer Erfolg und große Anerkennung gegönnt. Man wird ja sehen! It amazing to find oneself writing the review of yet another recording of a Meyerbeer opera! Such issues were the rarest events, but in the past two years some ten new recordings of works by the neglected and disparaged composer have appeared. 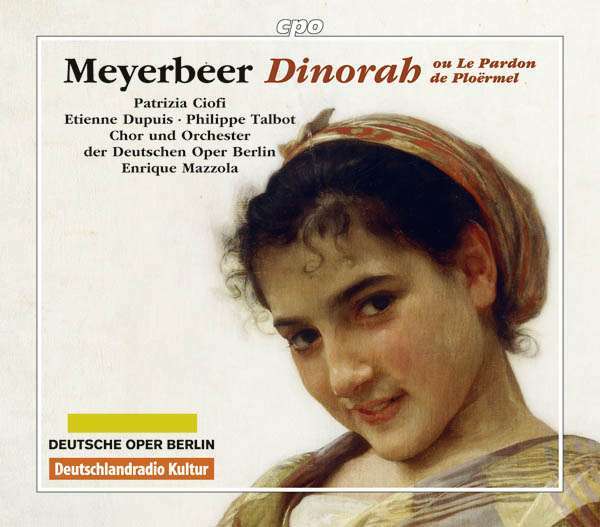 The latest is of Meyerbeer's penultimate opera, and second opéra-comique, ‘Le Pardon de Ploermel' (better know by the name of the heroine Dinorah). 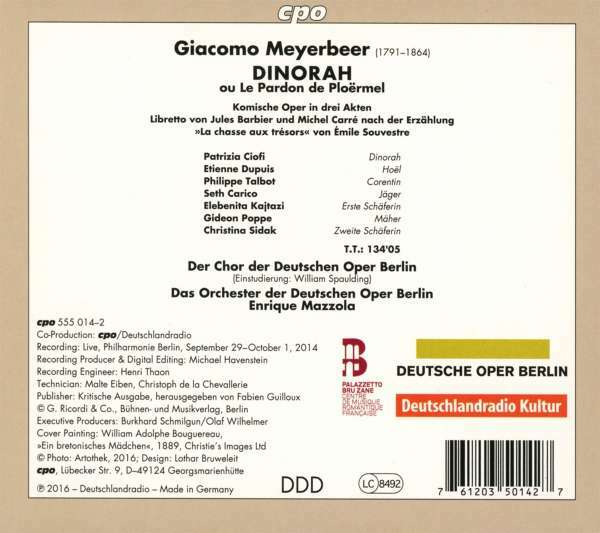 This is a live concert recording, made in Berlin as part of the Meyerbeer Cycle given by the Deutsche Oper. Live recordings are a mixed blessing (the Dynamic ‘Robert le Diable' and ‘Les Huguenots' are seriously disfigured by excessive stage noise.) Here such extraneous sounds and the audience participation have been reduced to a minimum, with an vivid immediacy of sound secured by the engineers. The main feature of this performance is the edition: this is the original form of the opera as presented in Paris on 4 April 1859 (five years before the composer's death). It is one of his riches and most rewarding scores, although the subject is an ostensibly slight rustic Breton tale of a lost treasure, calamity, obsession and betrayal (a pastoral in the manner of Bellini's ‘La Sonnambula'). Here we have the spoken dialogue essential to the opéra-comique (both the genre and the famous opera house). After the premiere Meyerbeer almost immediately wrote recitatives for the wider performance and distribution of the work. The recitatives are extremely elegant and melodious, and lend the score a seamless quality (They can be heard in the old Opera Rara recording of 1980). But diversity of genre is one of the characteristic attractions of Meyerbeer's art, so it is wonderful that we now have both forms of this beautiful score. The presence of dialogue is always challenging: one's enjoyment depends on the acting abilities and control of language by the artists involved, and can be a mixed blessing. Dialogue can be a factor that does not bear with much repetition (The most successful example that comes to mind is the altogether unsurpassable EMI recording oe Weber's ‘Der Freichütz' under Joseph Keilberth 1959, where the extraordinary rendition of the dialogue remains fresh and vivid on every hearing, evven after 50 years!). Here two of the central protagonists are French speakers and good actors, so the speech does across well, even if the impersonator of the sniffling coward Corentin (philippe Talbot) is given to shrieking, and does not achieve the marvellous persona of Alexander Oliver on Opera Rara. Corentin must be the foil to the dark, maniacally obessed Hoel (Etienne Duppius), a baritone role Meyerbeer wrote for the legendary Jean-Baptiste Faure. They sing their two duets with panache. But the central focus of the opera is always the pathetic vulnerable figure of the tragic Dinorah, who believing herself betrayed, wonders last in her won world of woods and fields (like Ophelia in ‘Hamlet').. Her legendary Shadow Song is one of the most famous and taxing arias ever written for coloratura, and known to all (a combination of the topoi of the mad scene and the balletic ‘Danse de l'ombre', as she, the moonstruck one, dances with her shadow in the moonlight). Patricia Ciofi, who recently triumphed as Princesse Isabelle in ‘Robert le Diable' (see the Briallaint recording and Covent Garden DVD), has become a specialist in this composer's challenging music. Her voice is clear and pure , free of the besetting plague of vibrato that is everpresent in operatic singing these days. She tackles the difficulties of the role with ease and accomplishment, and provides a charming restrained characterization. The other great feature of the opera is the orchestral writing, rich and colourful (from the extended tone-poem overture, through the delicate colouration of pastoral painting, to the terrific force of the transformatory storm that ends Act 2, and marks the cleansing turning point of the story, really a parable of redemption). The conductor, Enrique Mazzola, holds all together well, and brings out the multifarious instrumental colourations and tinting, Unaccountably, however, he allows the omission of the wonderful D-flat middle section of Hoel's great Act 1 Treasure Aria (one of Meyerbeer's most gripping inspirations), and also the exquisite middle section of the Act 2 entr'acte (another pastoral tone poem, this time in miniature), so curtailing and spoiling the expansiveness of the composer's inspiration). Both cuts are incomprehensible ans gratuitous. (For the former you will need to hear the accomplished Christian du Plessis on the Opera Rara recording; for the entr'acte try the Naxos recording of Meyerbeer's French Overtures). Ciofi and Dupius sing their duet in Act 3 superbly, and Ciofi's realization of the extended melodrama in the Shadow Scene in Act 2 is the most treasurable we have from this version of the original opera: the interwoven Leitmotifs of this beautifully-crafted score are revealed as never before. Do try this lovely work.